From Hugo Award-winner Tim Pratt comes a new fantastical adventure set in the award-winning world of the Pathfinder Roleplaying Game. 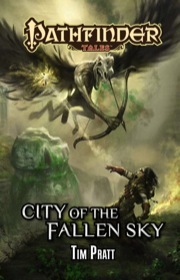 City of the Fallen Sky is sanctioned for use in Pathfinder Society Organized Play. Its Chronicle sheet and additional rules are a free download (270 KB zip/PDF). Bombs (and mutagens and extracts) away! This was quite fun. I enjoyed the protagonist, the companions, the antagonists, et al. I also enjoyed the journey from Andoran to the Mwangi Expanse and stops along the way. Many of the PF novels take place mostly in 1 country or area (which is fine of course), so it was nice to have a meandering journey in this book. A plot-twist at the end w/ 2 of the main characters was well-done, and avoided a cliche ending, which was most appreciated. Editing was pretty good (usually that's a pet peeve of mine in these books). Today I'm going to read the sequel, "Reign of Stars". What a great book! I've read several novels in the Pathfinder Tales line, and City of the Fallen Sky is the best of the lot so far. I'm a big fan of Tim Pratt from his Marla Mason urban noir fantasy series, but I wasn't sure whether he would "get" Golarion and a more traditional fantasy setting. He does, absolutely. There's a real verve to Pratt's writing, an exciting energy that keeps the pages turning as the story builds. His characters avoid being of the cliche "stock" type, there's plot twists when you least expect them, and a surprising (and appreciated) amount of world-lore that helps develop the setting further. The protagonist of City of the Fallen Sky is an alchemist named Alaeron. Alaeron lives in Almas (in Andoran), having recently returned from a dangerous escapade in Numeria where he discovered several strange devices from the ancient crashed starship known as Silver Mount. Alaeron is well-rounded, three-dimensional character: fascinated by mysteries and technology, but with just enough common sense to keep him ahead of the threats he has to face in order to delve deeper into the secrets he hopes to uncover. In trying to help out a woman Jaya, Alaeron angers a local crimelord and both he and Jaya are sent under the watchful eye of a murderous street thug named Skiver to travel to the ruins of Kho (in western Osirion), an ancient crashed "sky city" from the legendary empire of Shory. The adventure takes the three from Andoran to Absalom and from Absalom through various parts of Osirion. There are also well-integrated flashbacks of Alaeron's time in Numeria. The description of these places is fantastic, and I'll refer back to this book for an "eye-level" view the next time I run games that visit these locations. The three main characters are all well-drawn, with Skiver being particularly memorable. Yes, he's a murderer, but he has this strange, alluring charisma which makes it hard for the reader not to somehow cheer for him anyway. And he's gay, and I always appreciate it when authors recognize that not everyone, even in a fantasy setting, is heterosexual. The major villains of the piece are also really good, with a Numerian bounty hunter named Kormak reminding one of the Terminator in his utter determination (and indestructibility), while a crazed Shory noble is hilarious and creepy at the same time. The book is very faithful to the game, so Alaeron (the alchemist) uses things like bombs, mutagens, and extracts just like a character from that class would in the RPG. If the book drags for just a touch in the middle, it makes up for it with a fantastic final quarter. The ending is cinematic and exciting, and would make the basis for a great movie. Even the epilogue has a couple of nice twists, and sets things up for another book perfectly. If you can only read one Pathfinder Tales book, I'd suggest picking this one. I've been listening to this story for a while now on Audible. Excellent. This was a rather pleasant adventure novel, even moreso through the pov of the magical-scientific personage of Alearon. Though while the traveling is smooth (from the reader's chair anyway hehe) and the places they visit fantastical it is the characters and interactions where this novel truly shines. I actually found myself getting aggravated when action or some other dire element interrupted conversations wherein, not to say that those parts are boring or not well written (cause they aren't), the dialogue is just that good. I highly, highly recommend this one. Though its kinda hard to shake the feeling of kicked puppyness for poor Alearon at tge end at least he has some new toys he loves to take his mind off the matter. You got Tim Pratt to write a Pathfinder Tales novel!!! Sold!!! Numerian Super Science and a lost fallen Shory city? Sold! I know, right? I live in anticipation of the Tim Pratt short stories that show up on Escape Pod and Podcastle. I still can't listen to Restless in my Hand without tearing up. To the geniuses behind Paizo fiction contracts: Anything that Tim Pratt writes, I will pay for. Nice job. I haven't been drawn to the fiction line, but this looks great. Plus I want to support exploration of science fantasy in Golarion. I'll be buying this one for sure. My god. This sounds amazing. You had me at the first sentence. Wow! Nice cover! That thing is HIDEOUS!! And an alchemist wishing he was home in his laboratary! Do I remember reading that PF Tales were going to start coming out more often?? I would support such a move!! We're heading to a generally bimonthly schedule... although a delay at the printer is going to cause the next three volumes to come out in three consecutive months, so it's going to *look* monthly for a few months. Did you know this book is being sold *used* at up to $261.41? Seven chapter in and loving it. I don't have much time for reading lately and my Pathfinder Tales novels have been piling up unread (Except for Death's Heretic which was awesome). I decided to try to read the first chapter to see if anything grabbed me and it DID! Can't put it down now. This is the first I've read or even heard of this author, but man he must be popular cuz the writing style is amazing. Glad you're liking it, DMT! Tim Pratt actually won a Hugo a few years back (which is one of the most prestigious awards science fiction and fantasy has), so we were really lucky to be able to bring him on board for Pathfinder Tales. I was really pleased with the way he captured the feel of Golarion, including some rather tricky regions! If you like Tim Pratt, he has an urban fantasy series published under the name T.A. Pratt, and he's a prolific short story author. Many of his short stories are available for free as audio at Podcastle and The Drabblecast, which is where I first discovered him. This was great. One of my favorites in the line, and well-timed for getting a feel for Numeria for the Inner Sea Bestiary. I just got this 20 minutes ago, and can't wait to read it. I haven't been this excited about a novel since I could read. Gah, this'll (probably, you never know with international shipping) arrive this week and I've still not finished Song of the Serpent. Damn you Hitler and women of la Résistance. I just finished it. I LOVED this book. The characters were intriguing, funny, and well developed. Their banter had me laughing out loud in places. Especially the part with the crossbows vs. longbows and using wands. Well done. I look forward to reading more of Mr. Pratt's work. Hews up Tales People, more of Alaeron in this week's Web Fiction! Tim Pratt won a Hugo for a sci-fi short story, which is better than I could do. However, he does not appear to understand that alchemy is something other than modern science. This novel is littered with anachronistic language which undermines the story. Tim's writing is often cumbersome and disrupts his expression of ideas. As such, this is simply, mechanically, the worst piece of writing I have seen from Paizo: far below that of Gross, Cunningham, Jones or Sutter. Zernebeth grunted. “Adhesive?” she said. “Ah, right.” Alaeron reached into his coat, his fingers finding the right vial by the markings incised on the lid, and passed over a substance of his own devising. You might call it “glue,” but only in the same way you might call a broadsword a potato peeler. Zernebeth carefully tipped over the vial, dropping a blob of the pale pink adhesive onto the floor, then pressing the end of a climbing rope into the substance before it could dry. They waited a few seconds, then she tugged on the rope experimentally—the adhesive held it fast. The rope was stuck there permanently, probably—the glue was the strongest Alaeron could make, and it would hold the weight of a war mammoth. 1. Adhesive became a noun in the Victorian era, it feels modern and awkward. It damages verisimlitude for alchemy, an inherently magical process (explicitly so, in the Pathfinder rules, but also in the history and tradition of alchemy in the real world). 2. Potato Peelers are also Victorian, they superseded the paring knife. A paring knife was the traditional tool for vegetable peeling, trimming and slicing. Potato peelers are anachronistic to the setting and break suspension of disbelief, a paring knife was a simple and vastly superior alternative. 3. 'Carefully tipped'... Tipping a substance is not a careful activity, there are a lot of alternative verbs which would be vastly superior to tipped here: 'carefully tipped' is a dissonant phrase. I could do much, much more... and this is just the page I opened it on! This is poor and I don't know why it was published, Sutter himself would not produce a paragraph like that. Except that Golarion has printing presses and guns. So potato peelers aren't out of the question. Also Alaeron's understanding of Alchemy is as a scientific practice, others would treat it as a purely magical practice. He acknowledges that all of his extracts would only work on himself, being "attuned to Alaeron's specific magical field." Honestly this is how I treat alchemists in my games, and how I play them. Scientists with an aspect of magic. I don't think anachronisms are fair, Golarion isn't medieval Earth, it's probably closer to Renaissance tech in some places (and Victorian in other aspects). That said, I thought the book was too ambitious for the length of the journey. Parts felt rushed, the characters either should have started closer to Kho or a different lost city closer to Andoran should have been chosen the portion of the book in the city had no time to breathe and so an opportunity was missed to explore the city of Kho. The printing press pre-dates the potato peeler by about 400 years, guns were functional around the 16th century. I don't really buy any of Golarion as Victorian... but even if we accept the anachronisms, point 3-5 still stand. I can honestly say that nothing about Pratt's grammar jumped out at me when I was reading it. For me, the novel was a rollicking good time. If you disagree on that point based on your objections to Pratt's use of the English language, then perhaps he's not for you. One ounce of this adhesive covers 1 square foot of surface, bonding virtually any two substances together in a permanent union. Pratt's writing so far has been wonderful. Nitpicking supposed anachronisms is fun for some I suppose, but it read well to me. Typos happen, and I take full responsibility for "pressing" as opposed to "pressed." As I've said before (including in the Gamemastery Guide), calling out anachronisms in Golarion can be tricky, due to the simple fact that Golarion is *not* Earth. Unless there's a specific technology that it's building on and thus determines the sequence of events, the date a particular invention or convention came into use is often as much the result of luck than of anything else. Just because X came before Y on Earth doesn't mean it did so on Golarion--and it's worth noting that different cultures often develop different technologies at vastly different times. (For instance, Asia had gunpowder long before Europe, and it wasn't until European crusaders reached the Holy Land that they were introduced to the concept of "hospitals," etc.) Heck, many types of technology have risen in our own world, been lost, and then arisen again centuries later. And really, when you've got folks who can talk to gods, turn immortal, or make wishes come true, don't you think they could have invented the potato peeler a bit earlier than us? I mean, what's a 20 Intelligence for, if not that? However, that's all just my opinion, and taste in fiction is always a deeply personal thing. I'm sorry that you were disappointed, Geraint, and I hope that the other books in the line are more to your liking! I bought a copy of the book last week and finished it over the weekend. It was a jolly good rollicking tale. The nemesis was just a little bit over the top but was used well to keep things challenging for the protagonists. It was a good change of pace to see the hero not get everything he wanted and for a very good reason revealed at the end. I especially grew to like Skiver even though he never failed to stay true to his own nature. Hopefully they show up in future novels. Looking forward to more great reads from this novel line. It's funny. Until Captain Paradox's comment, I hadn't really thought about an interesting parallel. I completely appreciate that other people have different tastes and expectations, and I'm glad that many other people enjoyed this novel. I just wanted to share my frustration, in part because I know that this is the best way to get my feedback across to the editor of the line. Thankyou, James, for the eloquent response; although my experience from observing my grandmother (who can peel potatoes, apples and turnips with a knife, cut consistent,fine pieces of bread, bone a chicken etc. whilst chatting away and, seemingly, barely looking at the object in her hands) would suggest that the ancient chef would either be thinking: "Where's that lazy sous-chef got to now?" or planning next week's menu. I'm not really sure it is fair to accuse me of nitpicking: I don't have the time, inclination or character to go through every line of the book and pick away at the things which I found frustrating. I simply wanted to use an example to illustrate the misgivings I felt whilst reading the novel. So, for the record, I take no pleasure in nitpicking supposed anachronisms. I also take no pleasure in someone who disagrees with my opinion choosing to descend to the level of a personal attack when they could simply engage in a free and fair sharing of opinions. I'm even more unsure why Russ took my post and then carried it so very far away from what I had typed. I never intended to advocate writing Pathfinder Tales in Middle English; not that I have any inherent distaste for Middle English, Chaucer was able to use it to produce powerful and imaginative prose, I am simply more comfortable reading Modern English novels. I wonder, Ross, how did you come to connect my post to Middle English? Just to back up GeraintElberion here. While I did enjoy the book, I did 'notice' the things he was referring to; the choice of vocabulary felt slightly off for the Pathfinder universe. I still enjoyed the book, but it's like someone tapping you on the shoulder while you're immersed in a book - it takes you a moment to immerse yourself once again. This is not unique to City of the Fallen Sky. There was a little of this in Death's Heretic as well, a book which I enjoyed a great deal; as I recall some of the curses and discourse seemed kind of incongruous. In any event, I view City of the Fallen Sky as neither the strongest nor the weakest of the Pathfinder Tales books, and even the weakest of them isn't bad. In my judgement, there's a handful of the books I'd recommend to someone interested in the series, and the remainder I'd leave for them to read once they were interested. I think that Prince of Wolves, Plague of Shadows, The Worldwound Gambit and Death's Heretic are the four strongest books, all good, solid reads. I haven't yet found a book in the series that I think will become a classic in the fantasy genre, but the potential is definitely there. For the record, I think the folks who are bothered by the language have a legitimate complaint. Everyone has a different set point for the way they want fantasy characters (and narrators) to talk. Some folks want it to be in line with a given historical period (or at least nodding to it). Others want it to be more like Tolkien--what I think of as "high fantasy standard." And still others want the language to be as modern as possible. All of which comes down to the fact that, while there's no right answer, there is my answer, which naturally flavors Pathfinder Tales. Which isn't to say that there won't be books featuring all different types of language--if Ed Greenwood wants to write in more traditional fantasy prose, or Howard Andrew Jones wants to channel the pulp era, I'm not going to force them to change--but I definitely lean toward the more modern stuff. Thanks for the notes, everyone! This sort of stylistic discussion is really, really useful in helping determine the future of the line. For what it's worth, James, your taste seems to fall right in line with mine. Probably speaks to how much I absolutely loved Death's Heretic. So, as far as I'm concerned, just keep doing what you're doing. 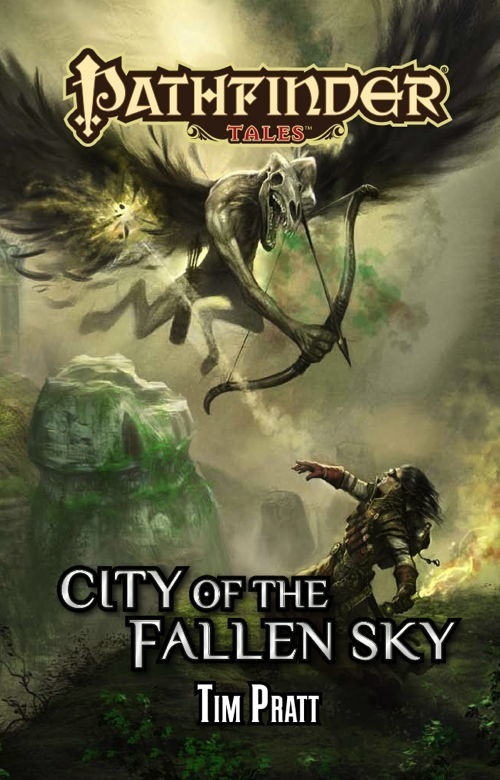 On topic, I greatly enjoyed City of the Fallen Sky, and would definitely place it in the top tier of the line thus far. I hope to have a review up soon. I wonder, Ross, how did you come to connect my post to Middle English? Because you picked on the use of the word "adhesive". I'd argue MUCH of the language used in the book didn't exist in ~1450, hence using Middle English for maximum linguistic accuracy. Or possibly Taldan. I increasingly think that Prince of Wolves is my favourite book in the line, simply because it is so charming. Gross' writing has a wit and lightness that is a real pleasure. Alongside Gross, I really enjoyed Sutter, Jones and Laws: I'm really glad that Laws and Gross are writing new books. I'm really excited about Merciel, her webfiction was very good and Nidal is an awesome place to let her loose on. Overall, the line is great and I'm glad to have this pile of fantasy romps on my bookshelf. Ah, so you didn't actually read my post, where I referred to the age of the word adhesive. No? I did read your post, which appeared to include a level of upset about using a word before it was coined. I'll spell it out for you: If you're going to pick on "adhesive" as being too modern a word for medieval fiction, why not be annoyed that the book's not written in Middle English too? It's already written in a language that didn't exist in the form it does now, so the whole book's a walking anachronism if you worry about the date well-established words were first coined. You write a novel in the language of the audience, not the language of the characters, else we'd be reading Golarion books written in Taldan. What I was trying to convey is that objecting to the age of a word that predates any of the readers is among the most ridiculous nitpicks I've ever seen someone come up with for a novel. Since I rather enjoyed that novel and would love to see that sort of writing style and word choice again in the line, I responded to your critique with my own commentary. To be clear, I'm not saying that the word choice wasn't jarring for you, I'm expressing my own preference that the editors and writers not worry about period too much, and focus on creating engaging stories. As soon as I read that, I started thinking of ways to include an alienist character in a Count Jeggare story. So, rather than accept that I have different tastes to you, you seek to belittle my tastes by setting up a false caricature of my opinions using reductio ad absurdum. I'm not sure when I offended you so much that you would choose to do that. It makes me quite sad. To be honest, I don't think that's what you're trying to express (perhaps I am wrong) but if you are going to begin with false dichotomies (the only choice is between either modern language I find anachronistic or Middle English) produced by reductio ad absurdum (if I don't like Victorian references which feel particularly jarring to my ear then I must be demanding novels in Middle English) then you end up sending your own ideas down the same path. There was a really interesting discussion about this begun by F. Wesley Schneider in which I expressed my ideas in a positive 'this is what I want' way, rather than the more negative 'this is what I don't like' way I did earlier. Perhaps that would express my view more effectively: "Your job (thankfully, not mine) is to find analogies that feel timeless." I would recommend that thread to anyone interested in Pathfinder, Golarion or fantasy writing in general, lots of really interesting thoughts. , else we'd be reading Golarion books written in Taldan. What I was trying to convey is that objecting to the age of a word that predates any of the readers is among the most ridiculous nitpicks I've ever seen someone come up with for a novel. I really find this hard to believe. 'Aeroplane' is a Victorian word (1873) and I imagine that would damage most people's immersion in a fantasy world like Golarion. Later on the alchemist character describes himself as a 'Scientist', even if that is not jarring to you, I hope you can see how the idea of a character using a pre-enlightenment, magical-thinking concept like alchemy describing himself with a post-enlightenment, Victorian term like 'scientist' might be jarring for other readers without them being 'ridiculous'. I'm not saying you have to agree with me, I'm just suggesting that you should be fair and reasonable with my point of view, rather than seeking to ridicule it. Perhaps I recognise the age of words like potato-peeler and adhesive more readily than some people, so they are more likely to leap to the forefront of my mind when I see them used anachronistically. Which is great, I just don't see the reason for the use of reductio ad absurdum and false dichotomy to create a kind of calumny which ridicules my opinion. If you wanted to say: "I disagree, I found the language refreshing and immediate, it really helped me to appreciate the characters." or something like that then you could have made a counter-proposal without the ridicule. This is normally such a pleasant board.